An elegant spacious villa with three en suite bedrooms, enjoying breathtaking views from a privileged location in the town of Fira. A private, serene paradise, at a walking distance from the center, with three private bedrooms and balconies overlooking the sea, the volcano and caldera cliffs. Ideal location, elegant decoration and unforgettable views. Built in 1809, with a traditional architectural style, our 120 m² villa has a private entrance and 2 private balconies offering a magnificent panoramic view of the bay of Fira and the surrounding islands and of course the world-famous Santorini sunset in a most tranquil location. Villa 1809 was renovated in 2011 and has conserved its unique style with high ceiling, minimal and elegant decor and Cycladic architecture accents uniquely combined with the comforts of today. The villa has three separate bedrooms, two of them are private and comfortable lofts, with views to the volcano. We had a great stay here. It’s manahed by Thireas Hotel next door so we got maid service and breakfast brought to villa daily. “Neck” our host from Thireas hotel is very polite,attentive and accommodating. 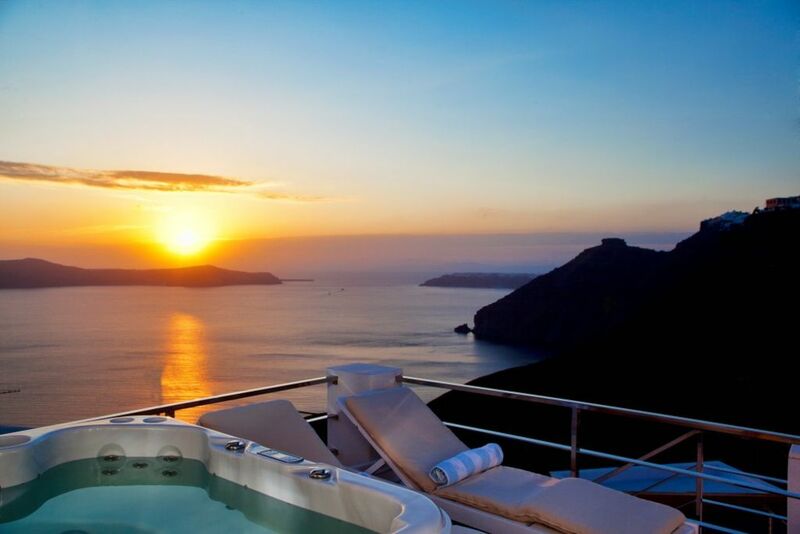 It’s the best location in Fira, you got the view of the caldera and the town of Fira right from the front porch. Very short walk to restaurants and shoppings. Host was incredibly polite, professional, and accommodating. They helped with our lugguage up and down many steps, arranged transportation, and provided a delicious breakfast daily. Our stay was perfection! We stayed four nights at this Villa. The owner arranged pick up at the airport for us and also to assist with the luggage as there were several steps to the Villa. It was a unique Villa, very well restored. The upstairs two bedrooms both had winding staircases so people with mobility may have a problem with this. There was a large bedroom on the main floor. As one person in our family has chemical sensitivities, the owner arranged to have the hot tub drained and filled with clear water so there would be no smell. Now that is service!! The evening sunsets were beautiful as we were able to sit on the terrace looking over the Caldera as the sun set. Every morning we were greeted with a huge breakfast delivered to the Villa. It was a remarkable stay. Thank you Petros! This Luxury villa in Santorini is situated in the heart of Fira just a step away from all the famous restaurants and the cosmopolitan life of Santorini but hidden in a quiet, picturesque neighbourhood of Fira and Santorini. This Santorini Villa overlooks the volcano and offers stunning views of the Aegean and the most beautiful sunsets in Santorini, serenity and peace.